This time around, it was a big second quarter that paced the Raiders to another huge win. 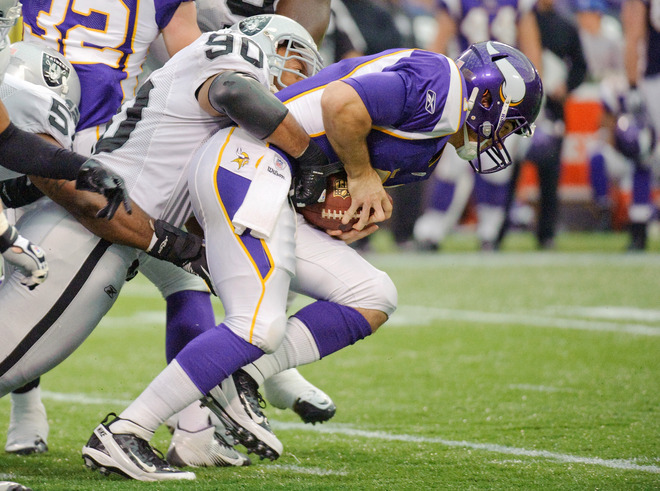 Carson Palmer threw for a touchdown and ran for another during the big second quarter, which the Raiders used to hold off the Minnesota Vikings, 27-21, at the Metrodome. Palmer passed for 164 yards and Michael Bush ran for 109 with a touchdown for the AFC West-leading Raiders (6-4), who have won their last two games. They also intercepted Minnesota quarterback Christian Ponder three times, including once in the end zone. Ponder threw for 211 yards and two scores for the Vikings (2-8), who dropped their second consecutive game and lost running back Adrian Peterson to an ankle injury in the first quarter. Oakland wide receiver Darrius Heyward-Bey left the game on a stretcher during the fourth quarter, after receiving a hit to his head. The Raiders faced a 7-3 deficit after the first quarter, but Matt Giordano’s interception of Ponder early in the second jump-started a 21-point period. The interception gave the Raiders the ball at their own 47, and they initially went backward because of a holding penalty and rushing loss. But Palmer sparked the drive with his 21-yard pass to Brandon Myers, and later found Denarius Moore for a 14-yard gain. Then, on 3rd-and-8 from the Minnesota 11, Palmer connected with Chaz Schilens for a touchdown that was upheld after review. The Vikings lined up for a field goal during the ensuing drive, but Chris Kluwe didn’t handle the snap correctly and was tackled for a 12-yard loss. That set the Raiders up at their own 43, and they again took advantage of the short field. Palmer hit Marcel Reece with a 12-yard throw on 2nd-and-9 from the Minnesota 14, and Bush ran it into the end zone on the next play. 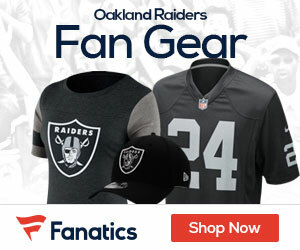 The touchdown gave Oakland a 17-7 lead with just 1:20 left in the half, and a fumble by Lorenzo Booker on the kickoff gave the Raiders another scoring chance. They started at the Vikings’ 16 and used an 11-yard pass by Palmer to move to the one. After calling timeout with 12 seconds to go, Palmer plunged up the middle and across the goal line. Armed with the 24-7 halftime lead, Oakland’s defense held on during the second half. It forced the Vikings to punt on their first two possessions of the third quarter, and Ponder was intercepted by Tommy Kelly on their third. But after Oakland’s Sebastian Janikowski kicked a 26-yard field goal, Minnesota did get a second touchdown thanks to two big gains. Ponder hit Devin Aromashodu with a 42-yard pass on the final play of the third quarter, and Percy Harvin scored on a 26-yard catch-and-run during the opening play of the fourth. Heyward-Bey was injured during Oakland’s following drive, when he caught the ball across the middle and was tackled. As he fell to the ground, the back of his head hit the leg of Vikings linebacker E.J. Henderson. Heyward-Bey’s helmet popped off and he lay on the field, visibly in pain. Trainers examined him on the field for several minutes before a cart drove the receiver, strapped to the backboard, off the field. That third-down play preceded Janikowski’s blocked field-goal try, which gave Minnesota the ball at its own 40 with more than 11 minutes to play. The Vikings marched into Oakland territory and were in position to score, with a 1st-and-goal at the 10. But on third down from the five, Ponder tried to connect with Aromashodu in the right-front corner of the end zone, where Stanford Routt picked off the ball. Bush’s fumble four plays into the ensuing Raiders drive gave Minnesota another chance, and this time the Vikings capitalized. Ponder’s 37-yard pass to Visanthe Shiancoe put the ball at the one, and he completed a touchdown pass to Kyle Rudolph on the next play. That score brought the Vikings within 27-21 with 5:08 left on the clock, and they got the ball back with three minutes to go after forcing Oakland the punt. But they didn’t cross midfield, and the Raiders ran off all but two seconds to secure the victory. Peterson’s 12-yard touchdown run with 5:17 left in the first quarter opened the scoring, but he injured his left ankle later in the frame during another 12-yard rush. He was helped off the field by trainers, rode a cart into the tunnel and did not return to the game. Janikowski kicked a 29-yard field goal with 57 seconds left in the first to put Oakland on the board.